911 IS A VALUABLE TOOL DURING AN EMERGENCY PLEASE DO NOT HESITATE TO USE IT. Most Important never call from inside a burning house EXIT THE HOUSE THEN CALL!! Only you can help Prevent Forest Fires Please do not discard lit items from your vehicle while driving. If you become trapped in your room put a towel or blanket against the bottom of the door; Place a blanket or some other piece of clothing visibly out the window & make a lot of noise so we know where you are and that we need to rescue you. Stop Drop & Roll this is what you should do if your clothes are on fire, always remember to cover your face. Never bury an extension cord under a carpeting, the insulation could wear-off causing a fire. Before using a Fire Place or Wood Stove make sure the Chimmney is professionally cleaned. Flammable products should not be with in a childs reach keep all matches, lighters and flammable products lockup and away from the child. Remind children never to remove batteries from the detectors, it could be a matter of life and death. Smoke Alarms should be replaced every 8-10 years. Remember when you change your clock for Day Light Savings Time; you should change your batteries in your smoke detector. Some smoke alarms are considered to be "hard-wired." This means they are connected to the household electrical system and may or may not have battery backup. If your smoke alarms are hard wired you will need to have a qualified electrician do the initial installation or install replacements. Stack firewood at least 100 feet away and uphill from your home. Clear combustible material within 20 feet. Use only UL-listed wood-burning devices. Stay alert! To prevent cooking fires, you have to be alert. You won't be if you are sleepy, have been drinking alcohol, or have taken medicine that makes you drowsy Keep anything that can catch fire - potholders, oven mitts, wooden utensils, paper or plastic bags, food packaging, towels, or curtains - away from your stovetop. 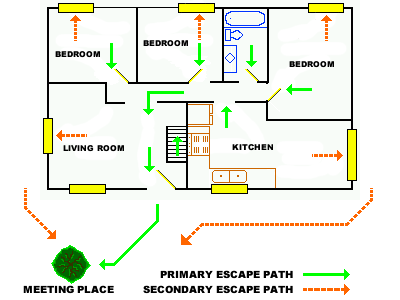 Make two ways out of every room, and decide on the best escape routes. Hold home fire drills. Practice your escape plan at least twice a year. Always practice like it is a real emergency by staying low and feeling doors before opening them. Pretend that some exits are blocked by smoke or fire and practice using alternative escape routes.